Yay! It's time for Halloween! This kit includes one of FIVE new mini shrines (the cubby in each is a hair over 2" x 2"... sized so you could use the numbered squares from one of the two scrapbook papers included in this kit, or one of the squares from the new Halloween 2x2s Collage Sheet). The kit also includes some numbered beads (for adding a "31" perhaps?) and a Wood Jack-o-Lantern Cut-Out... nice small sizes for adding trims to your shrine. See the "We Also Recommend" section below for photos/links to all the kit items, for more info and in case you want to buy them separately. And remember, here's a link to everything in this month's kit that is also available to buy separately. More coordinating goodies (and artwork) are in the blog post announcing this kit. 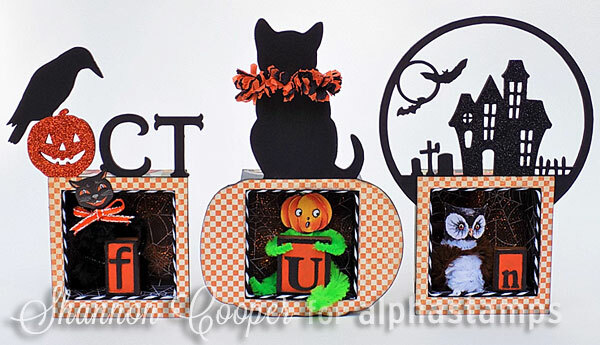 Design Team Member Shannon Cooper made October Fun Mini Shrines (see the wide photo below). More info in the blog and/or see the supply list.